This weekend, Wellesley’s Business Leadership Council celebrates its Silver Jubilee Plenary with a full weekend of activities. The weekend marks the 25th anniversary of the group, composed of alumnae leaders in the business and nonprofit sectors. The Business Leadership Council (BLC) was formed in 1989 by a group of alumnae who shared a common bond based on their experience in executive leadership and their Wellesley education. Recognizing the leadership preparation they received from Wellesley, the council was formed with the intent to give back to the College, its constituents, and the wider community through the unique talents of its members. In celebration of its silver jubilee anniversary, the BLC is hosting several events celebrating the legacy of leadership exemplified in the work of its members, and looking to the future of higher education. One panel discussion will involve four Wellesley College presidents; another will examine the founding of the BLC, discussing changes and remaining trends in the experience of businesswomen. Other sessions will explore emerging 21st-century trends and the status of women in the workplace. 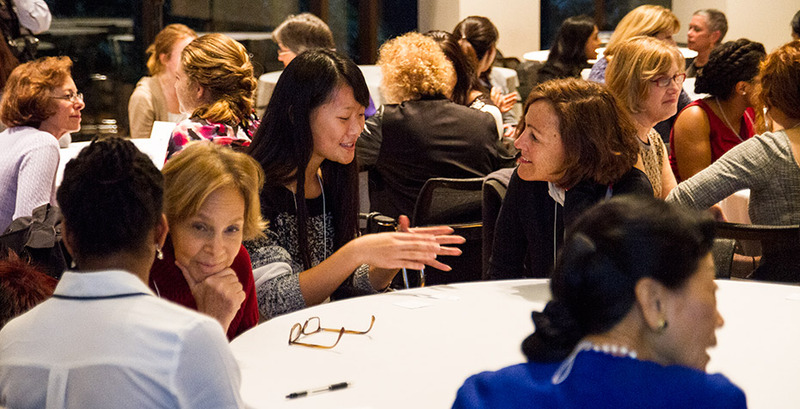 Part of the purpose of the BLC is to support Wellesley students interested in pursuing careers in business. As part of the weekend’s events, the council sponsored a panel and “speed-networking” session on Thursday in collaboration with the Center for Work and Service and the Wellesley Women in Business student organization. Over 100 students attended the event (pictured), which included a host of distinguished BLC members, whose experiences range from Fortune 500 companies, expertise in personal finance, philanthropic, and nonprofit organizations. Among them was Lulu Chow Wang ’66, who was recently profiled on the PBS episode Makers: Women in Business. A panel of alumnae spoke about the importance of mentoring throughout one's career, with useful tips that included what to look for in a male mentor and the suggestion to establish a time frame for a formal mentoring relationship so that it can "sunset" with ease. Then the structured networking was set up. Students and BLC members sat in alternate seats at round tables. For 10 minutes students spoke with the alum on their right; for 10 minutes they spoke with the alum on their left. The room was abuzz with high energy conversation. First year Gabrielle Taylor was surprised by how much the students and alums found in common with each other beyond merely their school, and was delighted by the openness with which they offered advice and personal contacts. She looks forward to more opportunities like this. Another first year, Delaney Ugelstad, found it very helpful to get the chance to talk with someone who majored in an area she is considering, and to find out how their career unfolded through that academic path. Economics major Violet Luo '16 found the event very helpful as a first step to "break the ice" in networking with alums. She had not realized how devoted to the network they truly are. "One woman drove six hours through the pouring rain to be here," she said. Econ minor and Africana studies major Courtney Jackson '15 received encouragement and ideas for avenues in business coming from a cultural studies concentration, and spoke for many when she shared her gratitude for the BLC and CWS for setting up the event and her admiration for the very impressive achievements of the alums who spoke with them. For their part, the BLC members were just as impressed at the poise and directedness of their younger Wellesley conversation partners. They said, "They are much more sophisticated than we were at that point," but also, "They shouldn't set their mind on investment banking from year one." Thankfully, they are willing to mentor and advise so that these current students' ambitions can be guided and balanced by the wisdom of their predecessors.